Our company was originally founded as “Chasapakis Bookbinding INC” in 1960, by book binding artist Theodoros Chasapakis in Athens Greece and has been active in the areas of traditional and artistic bookbinding, since. 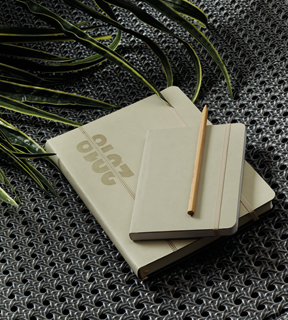 In 1994 the company was passed on to the new generation, Grigoria and Dimitris Chasapakis, who without denying the traditional business of bookbinding, decided to focus mainly on creating brand name products that would appeal both to the b2b and the consumer markets. In order to emphasize its new orientation towards the marketing and branding of its products for the global markets, the company was named: “The Writing Fields” to symbolize the total experience of handwriting. Meanwhile, after 2 years of research and with decades of experience in the bookbinding technologies, Dimitris Chasapakis discovered a new method which provides unique strength and flexibility to the binding of books, diaries and notebooks and he named it Flexbook. With an emphasis on materials and design, Flexbook was so different and unique that it quickly took off internationally as a global brand and The Writing Fields was able to create international interest for its products. In order to further boost sales abroad, the company is now in the process of developing a global sales network. The evolution of the company has been extremely rapid and today it is a modern vertically organized publisher and bookbinder with a leading position, in this market niche, in Greece. Concentrating mainly in the area of writing products and business gifts, The Writing Fields invests in innovation, with the goal of creating products for the global market.